As mountain adventure destinations, the Cordilleras Blanca and Huayhuash are unrivalled in South America. Well known amongst mountaineers, the unique landscape of sheer valleys, colourful alpine lakes, ice falls and giant glaciated peaks also offer some of the best hiking and biking on Earth. These ranges form the snowy highlights of Peru’s 2000km Andean spine, and routes that wind their way through dramatic alpine scenery have attracted trekkers for decades. What really distinguishes the area from other great ranges is the accessibility of high trails and peaks. There are no Himalayan walk-ins: you’ll be near a glacier by the second day of almost every multi-day hike in this book. 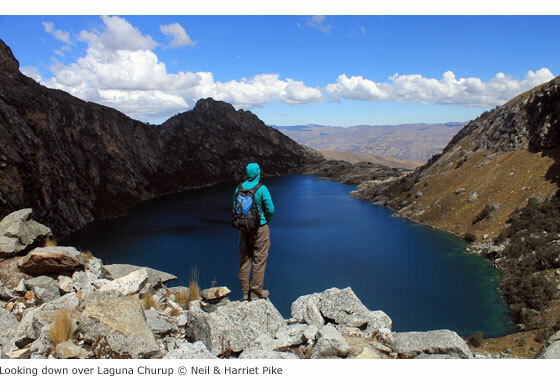 This brings with it the risk of going too high too fast, so spend time acclimatizing in the lively regional capital Huaraz beforehand – the city makes an excellent base for day hikes and rides. Situated in the department of Ancash, the Cordillera Blanca is sandwiched between the populated Callejón de Huaylas (the Río Santa valley to the west of the range, which houses Huaraz) and Callejón de Conchucos – the series of river valleys to the east of the mountains. The Cordillera Blanca is protected by Parque Nacional Huascarán, and treks within this park and in the Cordillera Huayhuash are in wilderness areas with sparse, but friendly, local populations. Lower down, expect a more colourful scene; it’s not unusual to happen upon a village fiesta with live music, traditional clothing, dancing, and of course a little drinking. Some walking trails were laid down by ancient civilizations millennia ago, but more recently audacious Peruvian road builders have chiselled ways through the heart of the Blanca – ribbons of dirt and tarmac which crawl up precipitous hillsides and drift within a stone’s throw of glaciers. Cycle tourers are drawn by the most thrilling high passes in the Andes – it won’t just be the altitude taking your breath away. 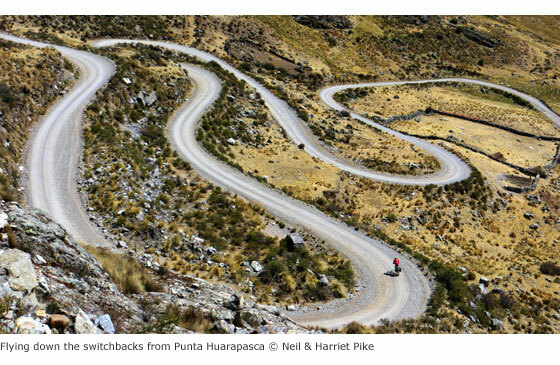 Cycling allows an authentic insight into Peruvian mountain life, the chance to pedal past campesinos out tending crops of quinoa and potato, and visit bucolic villages which are a world away from our fast-paced digital media age. Mountain biking is beginning to blossom in the region too. In a country known for its verticality, word is getting out about the extraordinary possibilities for cross-country riding or gnarly singletrack descents that shoot hundreds of metres down hillsides. The majority of outdoor-loving visitors to Peru make a beeline for the Inca trails near Cusco, but for those after magnificent mountainscapes and less crowded paths, these more northerly Cordilleras are the place to come.